"The Mercedes Benz SLK Aphelios Car was inspired by Ohrid trout, an endemic species in Lake Ohrid, Macedonia. 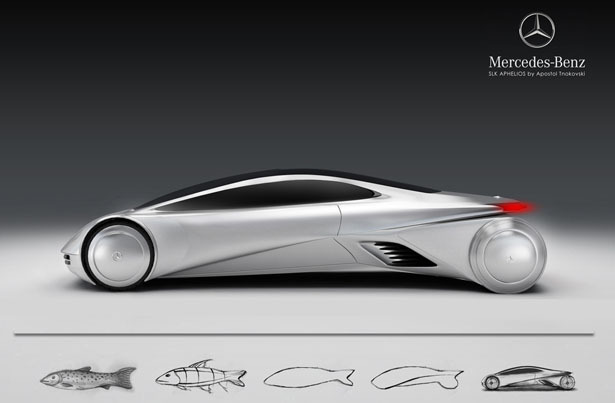 Apostol Tnokovski designed this concept vehicle as part of Macedonian Mercedes Design Contest. It’s a futuristic sports car with fluid body design to give you any sense of power and speed in visually stunning vehicle layout." For more pics & design jibber-jabber, click HERE. Wonder if it comes with "joy stick" steering. If anybody should have one, it should be you. Just think the electronic they have to employ, to avoid insects on the road. How do they breed out instinct to rise to a fly?